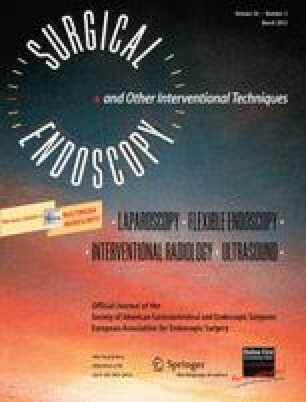 The aim of this study was to clarify the technical feasibility and oncological efficacy of laparoscopy-assisted gastrectomy (LAG) for gastric cancer compared with open gastrectomy (OG). Between April 2002 and March 2008, a series of 623 patients with gastric cancer underwent R0 gastrectomy (314 LAG patients and 309 OG patients). Age, gender, lymph node dissection, and pathological stage were matched by propensity scoring, and 212 patients (106 LAG and 106 OG) were selected for analysis after the exclusion of 40 patients who had proximal gastrectomy. Intraoperative factors, postoperative morbidity, long-term quality of life (QOL), and survival were evaluated. Moreover, these outcomes were also compared between the laparoscopy-assisted total gastrectomy (LATG) and the open total gastrectomy (OTG). There was no significant difference in preoperative characteristics between the two patient groups. Regarding intraoperative characteristics, blood loss was significantly lower in the LAG group (143 ml) than in the OG group (288 ml), while operation time was significantly longer in the LAG group (273 min) than the OG group (231 min). The degree of lymph node dissection and number of retrieved lymph nodes did not differ between the two groups. There were no significant differences in postoperative courses or overall and disease-specific survival (89.8% vs. 83.6%, P = 0.0886; 100% vs. 95.2%, P = 0.1073) except time to first flatus and time to use of nonsteroidal anti-inflammatory derivatives between the two groups. Significantly fewer patients felt wound pain in the LAG group 1 year after surgery. Analyses between the LATG and OTG groups showed similar results. LAG for gastric cancer may be both feasible and safe. However, it will be necessary to conduct a well-designed randomized controlled trial comparing short-term and long-term outcomes between LAG and OG in a larger number of patients. Drs. Chikara Kunisaki, Hirochika Makino, Takashi Kosaka, Takashi Oshima, Ryo Takagawa, Jun Kimura, Hirotoshi Akiyama, Masataka Taguri, Satoshi Morita, and Itaru Endo have no conflicts of interest or financial ties to disclose.